Without managed connectivity there is no IoT. Without device management there is no business case. Layers one and two in the IoT stack are inexorably linked. Connectivity enables data calls to be made to the devices, in turn device performance needs to be managed in order to realise the requisite solution. This process involves authenticating, provisioning, configuring, monitoring and maintaining the functionality of diverse devices. Secure access is a key component, but it is normally provided as an integral part of an end-to-end solution. Device management platforms must also enable networks to scale, provide secure access to the devices, detect and remotely troubleshoot problems, handle software updates and handle these tasks throughout the lifecycle. These platforms clearly play a pivotal role in today’s solutions and it’s one that will grow and expand in future. Processing and analysing data at the edge, for example, is a relatively recent development that introduces local computing facilities into the architecture. Software operating in commodity servers and intelligent gateways has to be constantly updated in order to leverage the value of actionable intelligence and data analytics. While this is a separate task, it clearly comes under the remit of device management and providing a service that enables it to be performed by a common platform is more efficient and effective. The IoT device landscape continues to grow in size and complexity. More and more heterogeneous devices must be managed on a single platform throughout the whole life cycle. This has resulted in the development of a comprehensive portfolio of services that operate at the device management layer as well as central dashboards that display an overview of the devices. In addition, there is an emerging market for device management as a cloud-based service, which Nokia offers as a pay-as-you-go subscription model. Nokia targets MNOs and MVNOs, who offer it to their enterprise customers in order to help them eliminate the complexity and cost associated with developing, sourcing and hosting their own devices. Devices generate data, which is the fuel that powers the IoT. Data management is used to enable seamless sharing of that data across users and devices from the edge to the cloud. 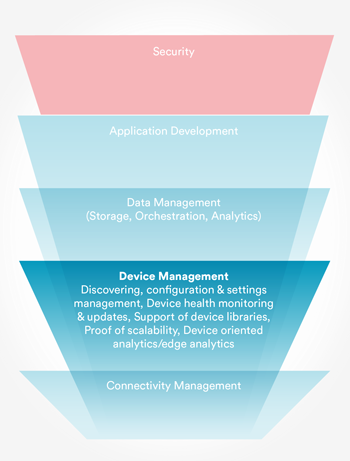 Therefore, device and data management platforms, which operate at layers two and three in the IoT stack, are also inexorably linked. Data management will be covered in more detail in the next edition of this newsletter together with a summary of the stack’s key functionality.